The varied landscape comprising hills, mountains, terraced rice fields, rugged coastlines and sandy beaches, forms a befitting backdrop to the deeply spiritual Bali, considered by many as the paradise on earth. Bali is the lone Hindu island of the predominantly Muslim archipelago of Indonesia. Elizabeth Gilbert's 2006 memoir Eat, Pray, Love and the subsequent film by the same name which prominently features this beautiful island, has added to its allure. But there is more to Bali than the element of spirituality. It also has on offer world-class surfing and diving, a large number of cultural, historical and archaeological attractions that you can enjoy if you set base in Nusa Dua in Bali. 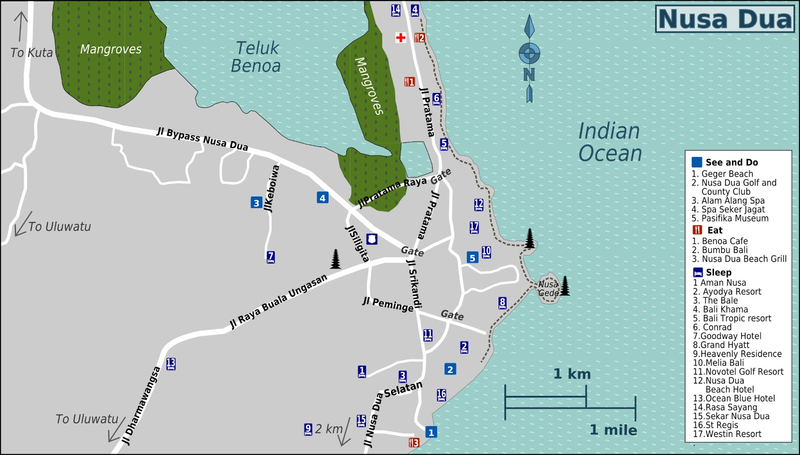 Nusa Dua refers to the entire eastern side of the Bukit peninsula at the southernmost tip of Bali. Some of the most glorious beaches of the island are to be found here. The resort is located about 40 kms south of Denpasar, Bali's capital. The airport is about 20 to 30 minutes drive away by car. 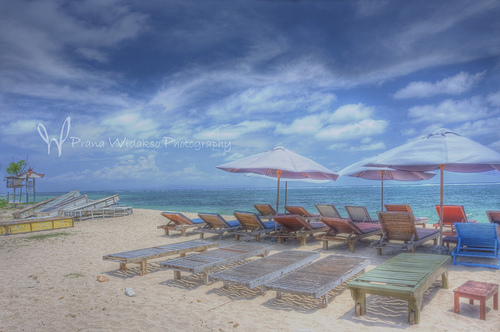 This is a public beach with splendid white sand and fine cooling breezes. It is one of the few beaches facing east and the because of the reef the water is warm. There is a restaurant and beach beds available. You can also enjoy a massage right on the beach. The museum is a must visit if you are interested to know more about the art scene in Bali. There are some European artists who have made Bali their home and their works are also on display here, besides work of other renowned painters. Also see the impressive Indochinese exhibition and the Polynesian artefacts. You can take a glass-bottomed boat from Nusa Dua and Tanjung Benoa that allow you to view marine life from within. Serangan is a turtle conservation area. The local people keep turtle eggs in traditional conservation houses. When the eggs hatch they release the babies on the beaches. Besides turtles, you can also see reptiles, birds, snakes and bats. This is one of the three top notch club in Bali and also the most popular given its convenient location. There are several packages on offer that promise great value for money. 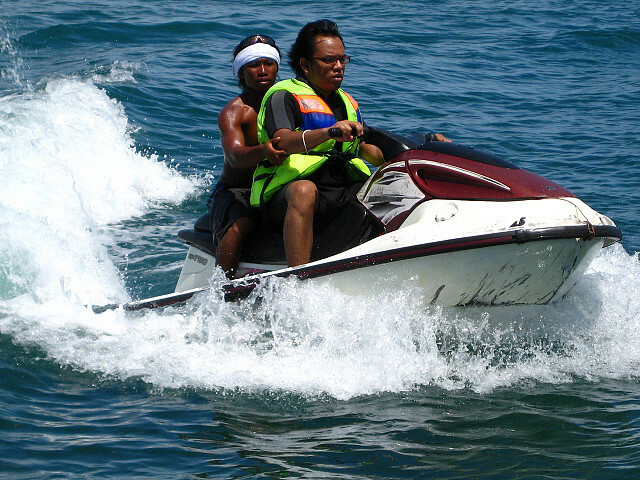 There are many water sports on offer such as banana boat, parasailing, jetski, diving, and flying fish. 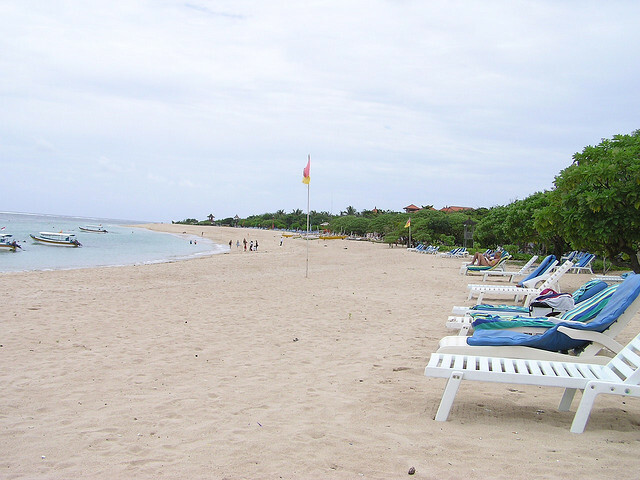 You can book directly on the beach at Nusa Dua or Tanjung Benoa, or have your Bali villa organise for you.